Of all the hand stitches, the back stitch is one of the strongest. 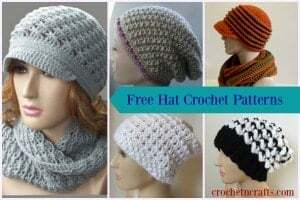 Not only is this a strong stitch, but the stitches on top of the fabric resemble that of the sewing machine, which means that you can use the stitch in almost any sewing project. The stitches on the bottom overlap each other and are twice as long as the ones that appear on top. These stitches are also known as stem stitches, and are commonly used in embroidery and top-stitching. Therefore, depending on your preference, both sides of the back stitch can be shown off on the right side of the fabric. The back stitch is an excellent seam stitch because of its strength and durability. It is great for reinforcing a variety of seams, especially seams that will be exposed to a lot of stress, such as in the armhole and crotch areas. The back stitch can also be used in places of the garment where it is hard to reach with a sewing machine. And because the stitches on top of the fabric resemble the stitches of a sewing machine, the hand sewn back stitch will blend right in with the rest of the stitches. Another beneficial use of the back stitch is for stuffed toys and pillows. They often go through a lot of handling, and a strong seam can help to prevent the pillow or stuffed toy from falling apart. As a result, any toy sewn or reinforced with a back stitch will be much safer for a baby or small child. To make the back stitch, bring the needle and thread through to one side of the fabric. If you want the stitches on the right side to resemble sewing machine stitches, then you will need to insert the needle from the wrong side of the fabric. But if you want the stem stitches to appear on the right side, then you’ll have to make the first insertion from the right side of the fabric. Whether you want the small stitches to appear on the right side or wrong side, you should always hold the fabric so that they appear on top. This will help you to better see where to insert the needle next. At least this works best for me. Once you have brought the needle and thread to one side, go backwards with the needle and insert it a short distance to the right side of where the thread originally came out. 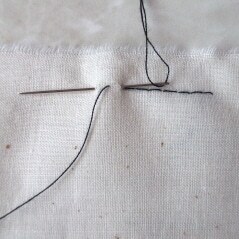 Bring the needle forward (to the left), and insert it the same distance in front of the original thread as you went back. Pull the thread through nice and snug, but not too tight as the fabric will pucker. Continue inserting the needle to the right of where the last thread came up, and bringing it up the same distance in front.